Frost heave. An upward movement of the subgrade resulting from the expansion of accumulated soil moisture as it freezes. Thaw weakening. A weakened subgrade condition resulting from soil saturation as ice within the soil melts. Figure 1. Frost heave on a city street in central Sweden. Frost heaving of soil is caused by crystallization of ice within the larger soil voids and usually a subsequent extension to form continuous ice lenses, layers, veins, or other ice masses. An ice lens grows through capillary rise and thickens in the direction of heat transfer until the water supply is depleted or until freezing conditions at the freezing interface no longer support further crystallization. 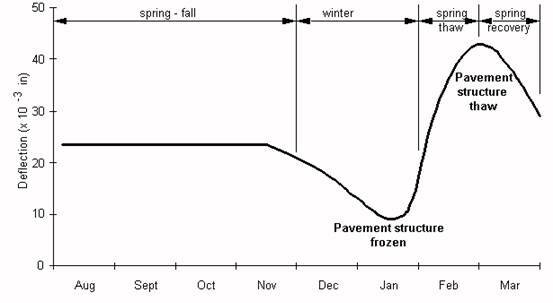 As the ice lens grows, the overlying soil and pavement will “heave” up potentially resulting in a cracked, rough pavement (see Figure 1). This problem occurs primarily in soils containing fine particles (often termed “frost susceptible” soils), while clean sands and gravels (small amounts of fine particles) are non-frost susceptible (NFS). Thus, the degree of frost susceptibility is mainly a function of the percentage of fine particles within the soil. Many agencies classify materials as being frost susceptible if 10 percent or more passed a 0.075 mm (No. 200) sieve or 3 percent or more passed a 0.02 mm (No. 635) sieve. Figure 2 illustrates the formation of ice lenses in a frost susceptible soil. Figure 2. Formation of ice lenses in a pavement structure. Frost susceptible soil (significant amount of fines). 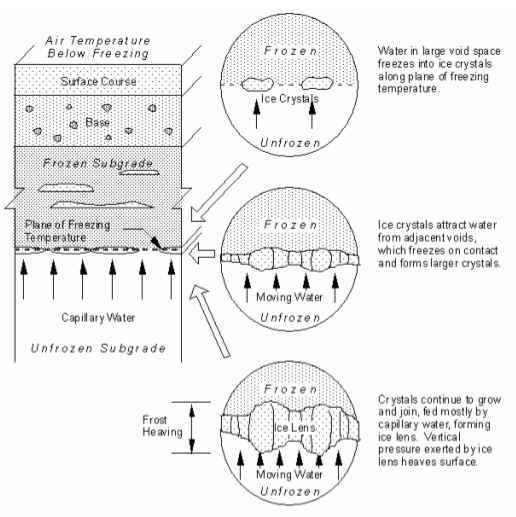 Subfreezing temperatures (freezing temperatures must penetrate the soil and, in general, the thickness of an ice lens will be thicker with slower rates of freezing). Water (must be available from the groundwater table, infiltration, an aquifer, or held within the voids of fine-grained soil). Where subgrades change from clean not frost susceptible (NFS) sands to silty frost susceptible materials. Abrupt transitions from cut to fill with groundwater close to the surface. Where excavation exposes water-bearing strata. Drains, culverts, etc., frequently result in abrupt differential heaving due to different backfill material or compaction and the fact that open buried pipes change the thermal conditions (i.e., remove heat resulting in more frozen soil). Application of the Casagrande criterion requires a hydrometer test of a soil suspension (in water) to determine the distribution of particles passing the 0.075 mm sieve and to compute the percentage of particles finer than 0.02 mm. Thawing is essentially the melting of ice contained within the subgrade. As the ice melts and turns to liquid it cannot drain out of the soil fast enough and thus the subgrade becomes substantially weaker (less stiff) and tends to lose bearing capacity. Therefore, loading that would not normally damage a given pavement may be quite detrimental during thaw periods (e.g., spring thaw). Figure 3 is an example of typical pavement deflection changes throughout the year caused by winter freezing and spring thawing. 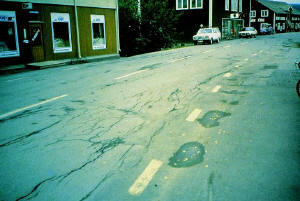 Figure 4 shows pavement damage as a result of thaw weakening. Figure 3. Typical pavement deflections illustrating seasonal pavement strength changes (on a portion of State Route 172 in Washington State). Thawing can proceed from the top downward, or from the bottom upward, or both. How this occurs depends mainly on the pavement surface temperature. During a sudden spring thaw, melting will proceed almost entirely from the surface downward. This type of thawing leads to extremely poor drainage conditions. The frozen soil beneath the thawed layer can trap the water released by the melting ice lenses so that lateral and surface drainage are the only paths the water can take. This observation shows that (1) the reduced density of base or subgrade materials helps to explain the long recovery period for material stiffness or strength following thawing, and (2) refreezing following an initial thaw can create the potential for greater weakening when the “final” thaw does occur. Surface water. Enters the pavement primarily by infiltration through surface cracks and joints, and through adjacent unpaved surfaces, during periods of rain and melting snow and ice. Many crack-free pavements are not entirely impermeable to moisture. Groundwater table (or perched water table). Moisture held in soil voids or drawn upward from a water table by capillary forces. Moisture that moves laterally beneath a pavement from an external source (e.g., pervious water bearing strata, etc.). Limit the depth of frost into the subgrade soils. This is typically accomplished by specifying the depth of pavement to be some minimum percentage of the frost depth. By extending the pavement section well into the frost depth, the depth of frost-susceptible subgrade under the pavement (between the bottom of the pavement structure and frost depth) is reduced. The assumption is that a reduced depth of soil under frost action will cause correspondingly less damage. Removing and replacing frost-susceptible subgrade. Ideally the subgrade will be removed at least down to the typical frost depth. Removing frost-susceptible soils removes frost action. Design the pavement structure based on reduced subgrade support. This method simply increases the pavement thickness to account for the damage and loss of support caused by frost action. Providing a capillary break. By breaking the capillary flow path, frost action will be less severe because as Tabor (1930) noted, frost heaving requires substantially more water than is naturally available in the soil pores. Figure 5. 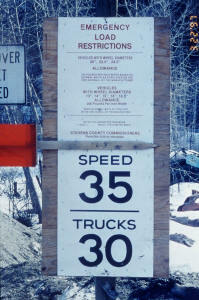 Emergency load restrictions sign. Where to apply load restrictions. If pavement surface deflections are available to an agency, spring thaw deflections greater than 45 to 50 percent of summer deflections suggest a need for load restriction. Further, considerations such as depth of freezing (generally areas with air Freezing Indices of 400 °F-days or more), pavement surface thickness, moisture condition, type of subgrade, and local experience should be considered. Subgrades with Unified Soil Classifications of ML, MH, CL, and CH will result in the largest pavement weakening. Amount of load reduction. The minimum load reduction level should be 20 percent. Load reductions greater than 60 percent generally are not warranted based on potential pavement damage. A load reduction range of 40 to 50 percent should accommodate a wide range of pavement conditions. When to apply load restrictions. Load restrictions “should” be applied after accumulating a Thawing Index (TI) of about 25 °F-days (based on an air temperature datum of 29 °F) and “must” be applied at a TI of about 50 °F-days (again based on an air temperature datum of 29 °F). Corresponding TI levels are less for thin pavements (e.g., two inches of HMA and six inches of aggregate base or less) in that the “should apply” TI level is 10 °F-days and the “must” TI level is 40 °F-days. Frost heave. Results from accumulation of moisture in the soil during the freezing period. These accumulations (ice lenses) expand perpendicular to the direction of heat flow and push the pavement up, often causing severe cracking. Thaw weakening. Once a subgrade is frozen it can be severely weakened when it thaws (usually in the spring time). Therefore, loading that would not normally damage a given pavement may be quite detrimental during thaw periods. Limit the depth of frost-susceptible material under the pavement structure. Remove and replace the frost-susceptible subgrade. Design the pavement structure based on reduced subgrade support. Force a break in the groundwater’s capillary path. If frost action cannot be adequately mitigated, severe pavement damage (in the case of frost heave) or a loss of bearing capacity (in the case of thaw weakening) can result. 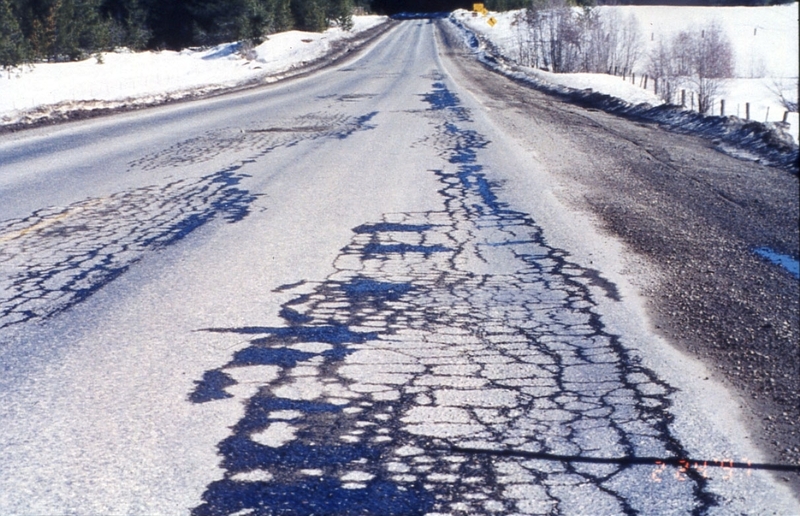 Maintenance options to correct these problems are limited to pavement repair or replacement (in the case of frost heave) or limiting pavement loading during spring thawing (in the case of thaw weakening).